← I’m at a wedding cake competition!! i got sick eating cakes last night. and i loved it. 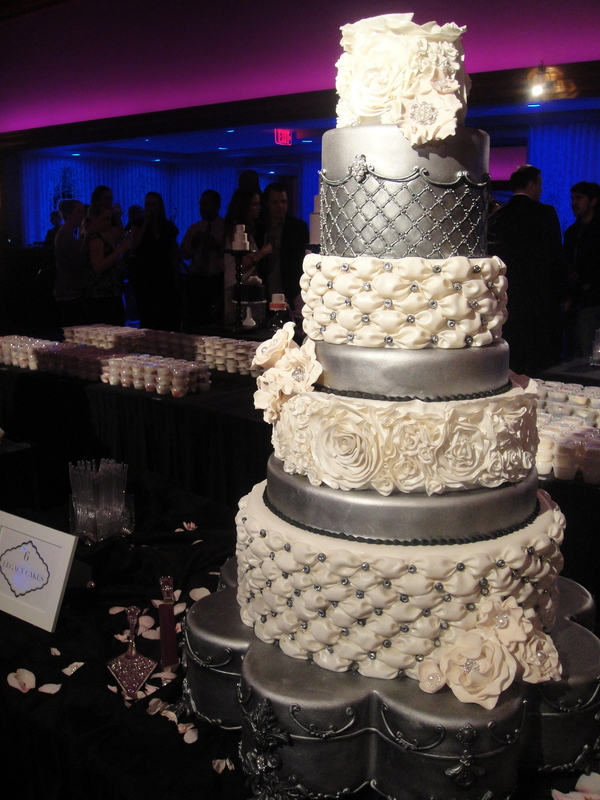 last night was the 3rd annual platinum wedding cake competition held in dallas, texas. eight bakeries were chosen to compete for “best taste” and “best in show.” the former was chosen by a panel of judges and the latter was chosen by the crowd. first of all, i really hope i get to attend more of these events. heck, i’ll even attend an elementary school’s cupcake competition if they had one. anything to eat pastries for free! there were also free appetizers and an open bar! i don’t drink so i sipped on some coca cola classic. as far as the cakes went…they were all beautiful. gorgeous. now, the flavors…some were a total HIT and some were a complete (dry) MISS. if there is something i absolutely can’t stand, it’s dry cake. before each cake, i will introduce the bakery and flavor of the cake…and what my taste buds thought of each one. Orange Grand Marnier Cake. delicious, and i loved the icing, whatever it was. 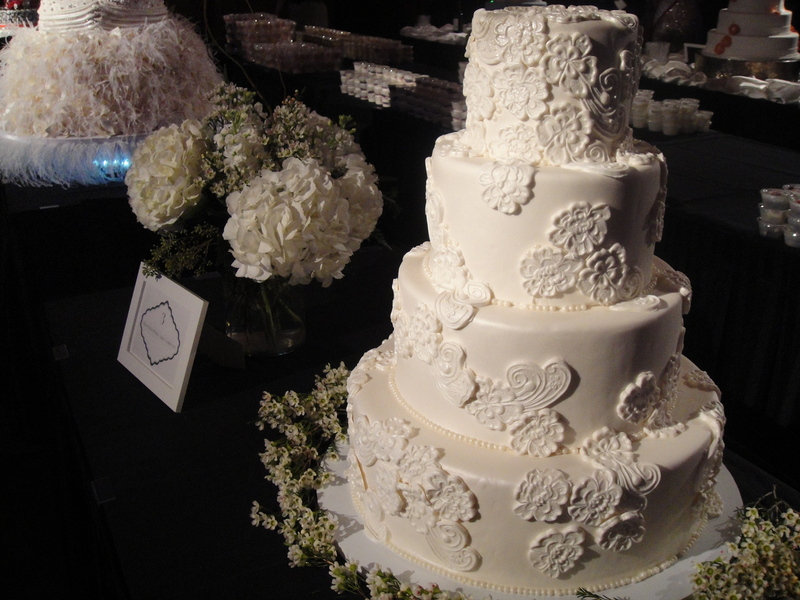 i had the chance to taste their cake last year at the dallas bridal show i attended in october…they had a 4-layered slice sample that had a different flavor for each layer. might i say that i went nuts. it was one of the most amazing slices of wedding cake i have ever tasted. 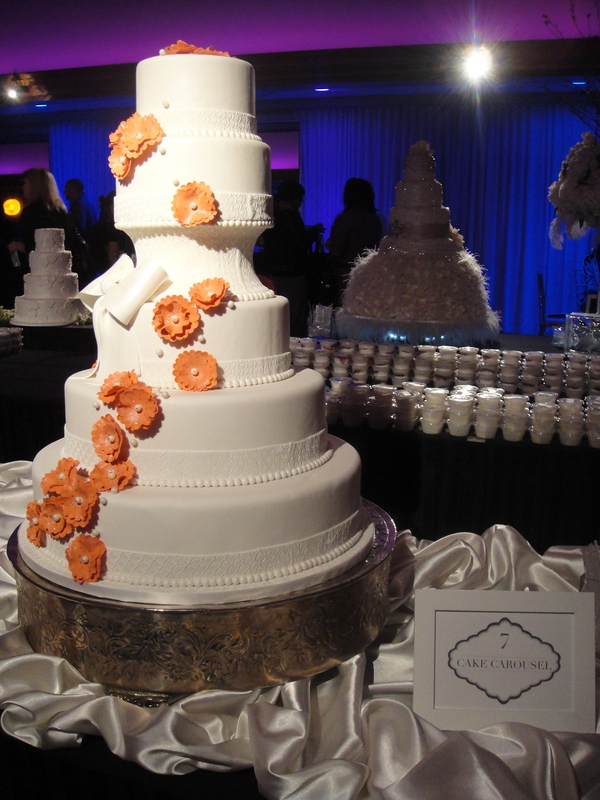 and i know that wedding cakes don’t usually come with 4-layered slices…but each of those flavors were just amazing. so i was excited that i got to taste test their cake again…and pleased that it was just as delicious. as far as the design goes, i thought it was gorgeous. if you stood in the far back of the room, away from the cakes, your eyes would most likely catch this cake first because of the pop of color. 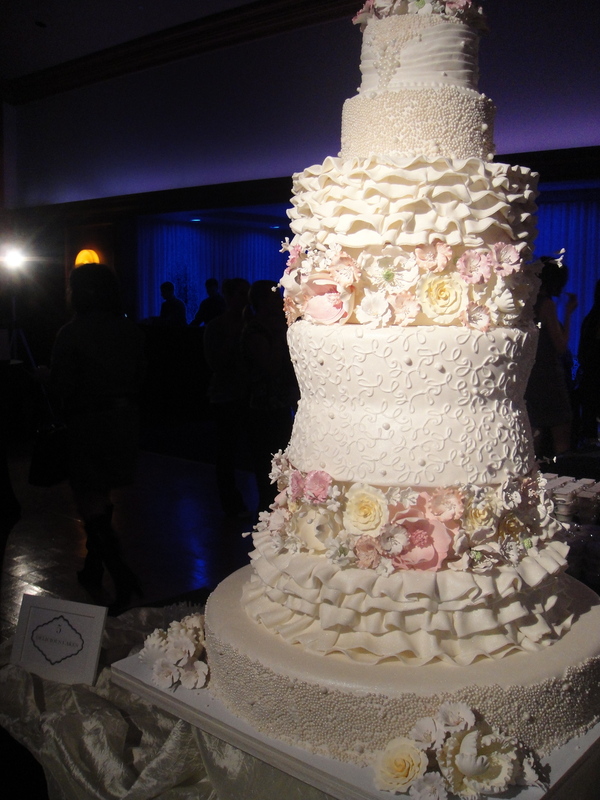 i posted some pictures of some of the cakes that opulent cakes did for the dallas bridal show in october, and if you want to see them, click here to be directed to that blog. i wore a dress made out of PAPER that day! it was fun! White Cake with White Chocolate Mousse and Raspberry Fruit Filling. mmmm, delicious…that raspberry was amazing, that icing was amazing…mmmm….and just to let y’all know, the cake was on a generator that spun it around so you could see the cake from front to back, because it was so highly ornate! i also posted a picture of what the cake looked like as i was putting it in my belly. 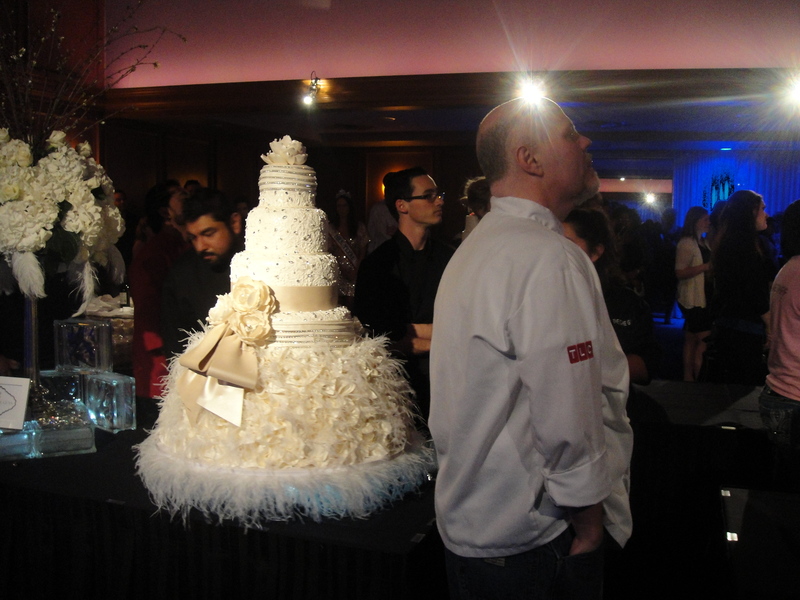 standing in front of the cake is chef chad fitzgerald of the cake guys, who is on TLC’s Next Great Baker. 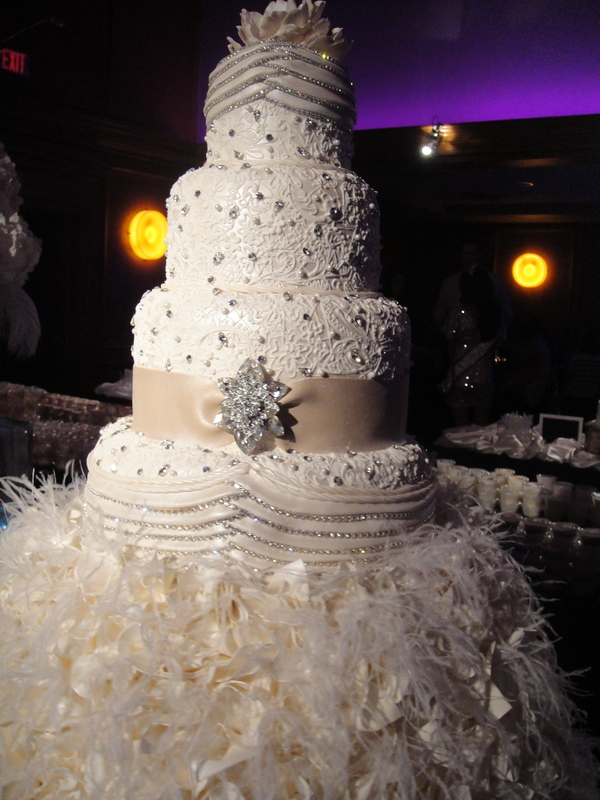 this cake…or shall i say “cake dress”….DUH, TOOK FIRST PLACE FOR BEST IN SHOW! 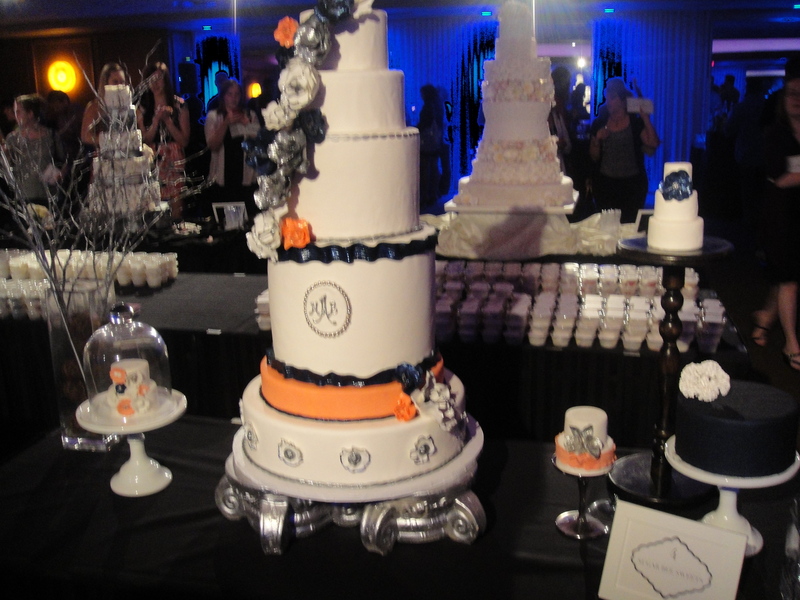 as they did last year, too…i asked chef chad how long it took to decorate the cake and it took about 14 hours non-stop. amazing! 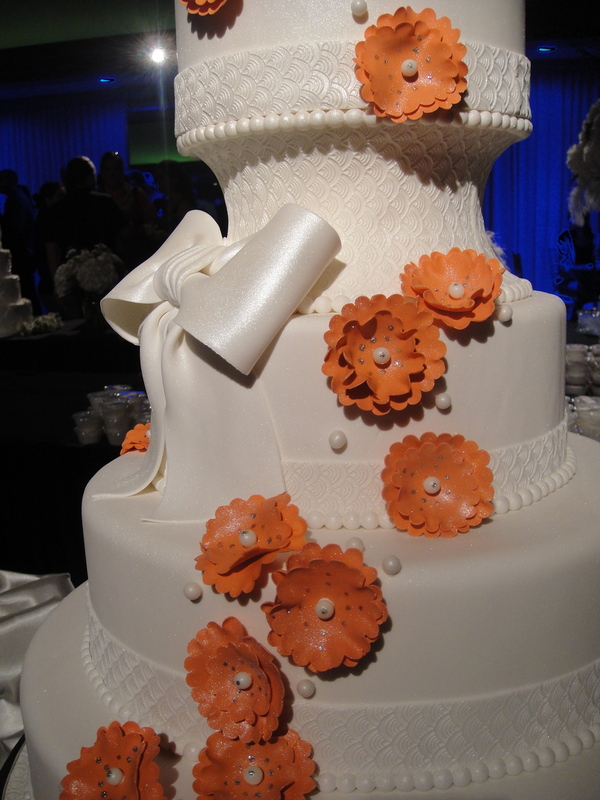 each fondant “flower” with the feathers were applied individually to the bottom part of the cake. craziness!!! White and Black Cake with Vanilla Buttercream and Raspberry Filling with Chocolate Butter Cream Frosting. unfortunately, i don’t remember how this cake tasted…hm. i feel bad, but then again, in a competition that requires you to stand out, i think it should be important to come out with a flavor that makes a statement. as far as the design goes, i love a white on white presentation, but i could have done without about a quarter or a third of the flowers. my co-worker said that they should have added an extra tier and i agree. this cake was definitely the shortest and smallest out of all the competitors. then again…it was the shortest, smallest, and plainest out of all the competitors. but it was still cute. Vanilla Cake with Honey Banana Jam and Cream Cheese Filling. what a DELICIOUS cake!!!! what a very unexpected burst of flavor! talk about a party in my mouth!!! 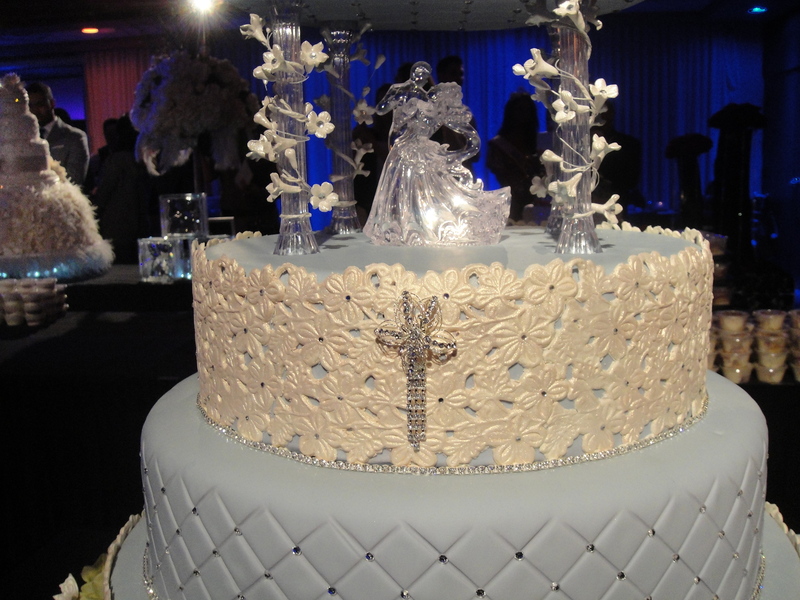 as far as the design, i loved how clean the cake looked. i also enjoyed how it was the only cake i noticed that i thought of using for other occasions-think of a gentleman having his 50th birthday party. it was very simple, yet very elegant. this design took 3rd place for BEST IN SHOW. Vanilla Cake with a mix of Buttercream and Cream Cheese topping, then Raspberry Mouse over Raspberry Liquor Cake with Butter Sauce. umm…there was A LOT going on with this cake flavor…it was an overload of icing. it felt as if i ate a tub of buttercream icing. i looked at the open bar and thought, “i really could use a gallon of water right now to wash this down…” as far as the design goes, i loved the colors of the cake. i thought this was the “busiest” looking cake out of all of them. 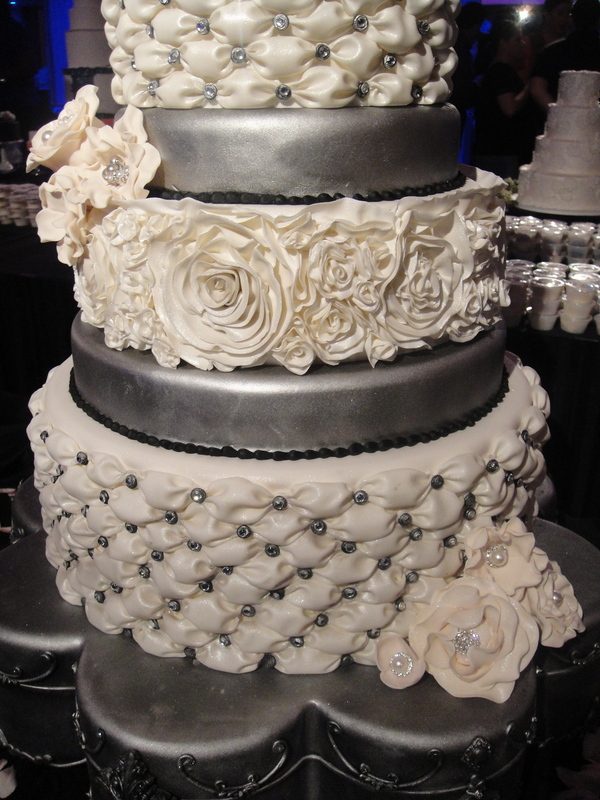 i didn’t like the tiers that had the covered pearls, especially the bottom tier. it looked unfinished. i loved how “spring” the cake looked, though. White Chocolate Cake with a White Chocolate Ganache and Chambord Buttercream. yummy cake, the white chocolate ganache was on point. i was really enjoying all the white chocolates! it’s not too overwhelming as a flavor. the design was absolutely gorgeous. 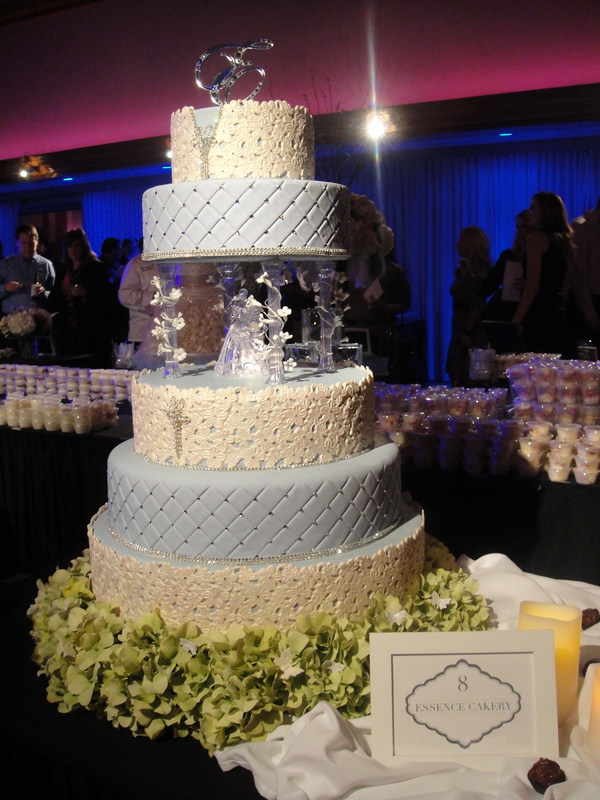 i especially loved the fondant gathered tiers. 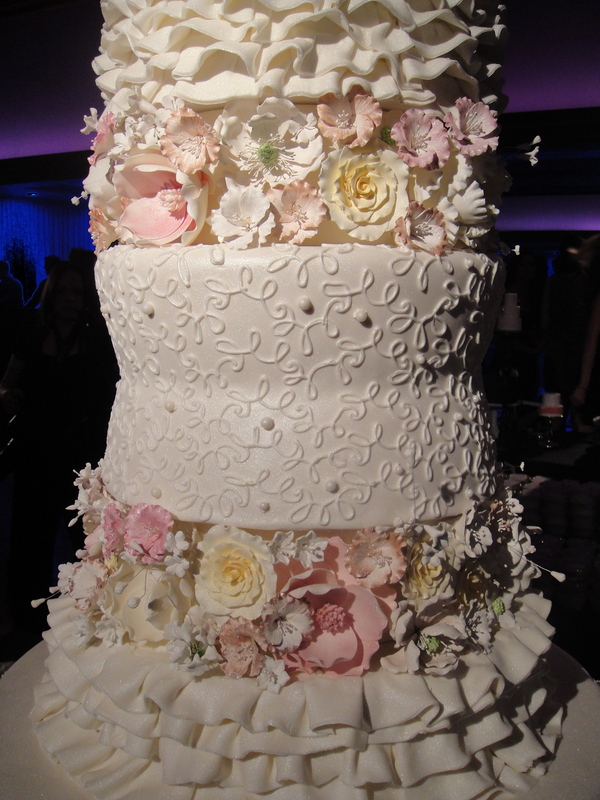 in case you don’t notice, this is an 8-tier cake. the base is also a tier! 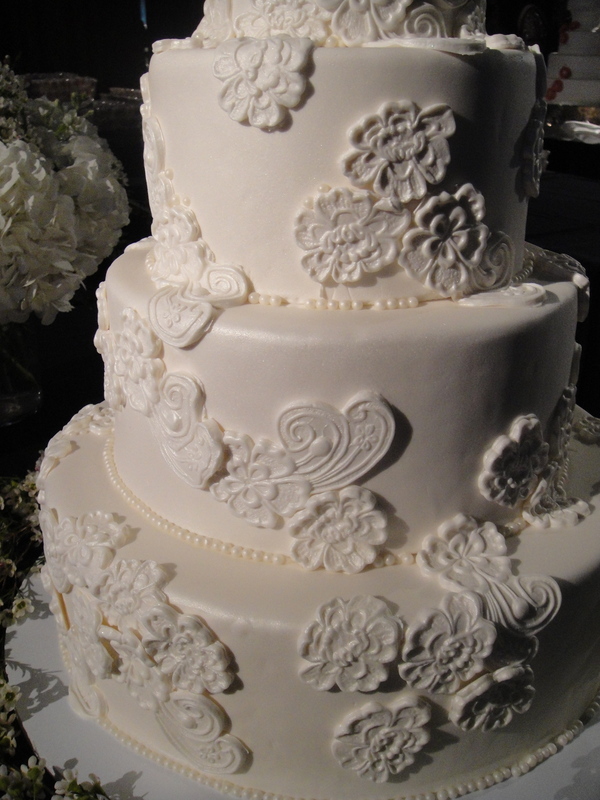 the piping on the gray tiers were just amazing. i don’t know how these chefs do it. i just don’t know. this design took 2nd place for BEST IN SHOW. Amaretto Cake with Lemon Mousse Filling. this cake was divine. 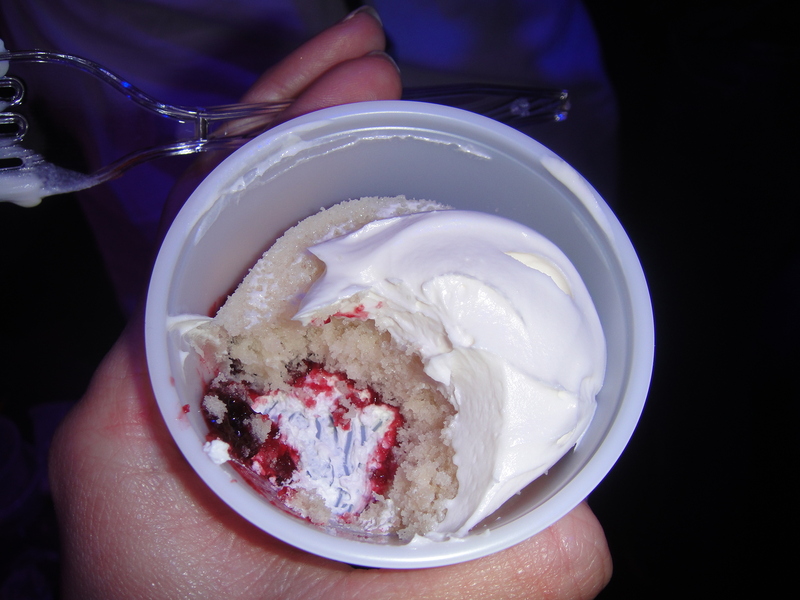 i was very, very upset that chef kelli duffy did not take a win for flavor this evening, i thought this cake flavor was so light and refreshing, definitely something i would have loved to have a HUGE piece of after any type of dinner because it’s not heavy. the cake texture was perfect and the lemon mousse filling was delicious that if i had to eat them separately, i would have really enjoyed each alone. did i mention i was upset that they didn’t take a spot for best flavor? 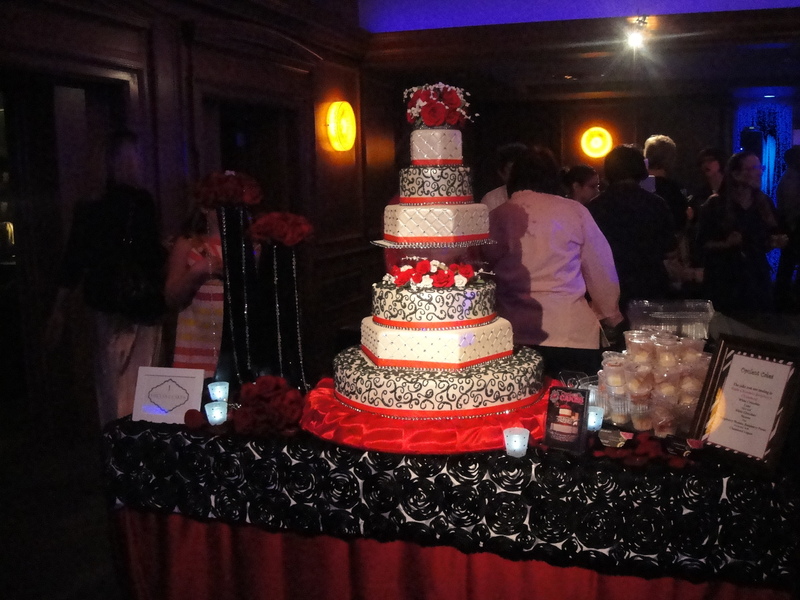 ugh…i loved the design of the cake. i love how clean it looks and how simple it is. 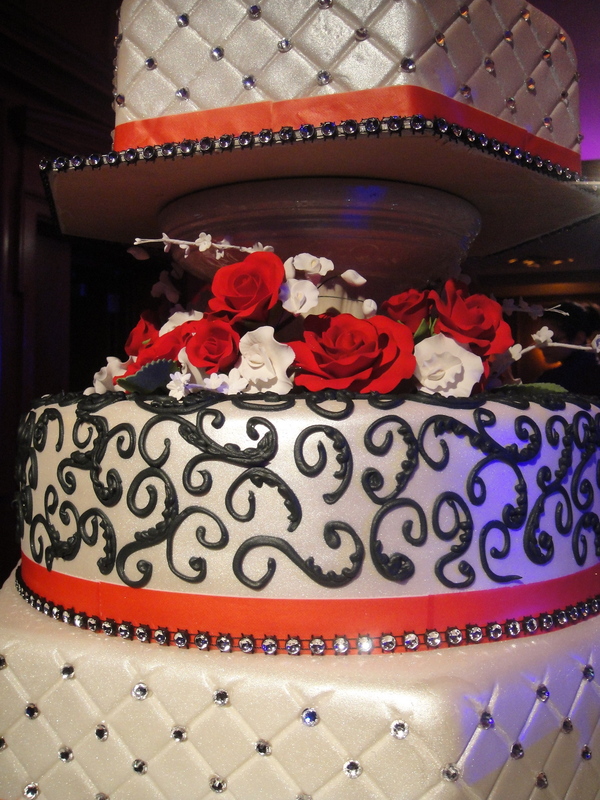 the pop of color was pretty and the tiniest details on the cake were flawless. Cassata Cake with French Mousseline, Raspberry Jam and Cream Cheese Frosting. umm…my co-worker said it best…”it’s like i’m eating cornbread.” it definitely was the most unusual cake texture out of all the cakes i tasted, but i’m not sure if that was in a good way or in a bad way. i googled “cassata” and based on what i read, i didn’t get that from the cake i had. in fact, i didn’t eat the entire piece. it just didn’t do anything for me, unfortunately. as far as the design went, i loved the blue, quilted tiers. i loved how the design faded into a nice, smooth fondant. i think if the columns were removed, i would have enjoyed the cake design more. i had a blast tasting all these cakes. i have a blast anywhere there is food, really. haha! but they are usually never pastries! i thought the designs were all very gorgeous, and i commend anyone who does cake because i don’t know if i’d have the patience to do it. i don’t know if i’d be able to work with fondant in large pieces, and i don’t even have a big kitchen to work in, so that would frustrate me. the night was definitely inspiring as far as design and flavor went. This entry was posted in bakeries, baking, cakes, fondant, frosting, Uncategorized, weddings and tagged Baking, Bridal Cakes, Desserts, food, Pastries, Wedding Cakes. Bookmark the permalink. 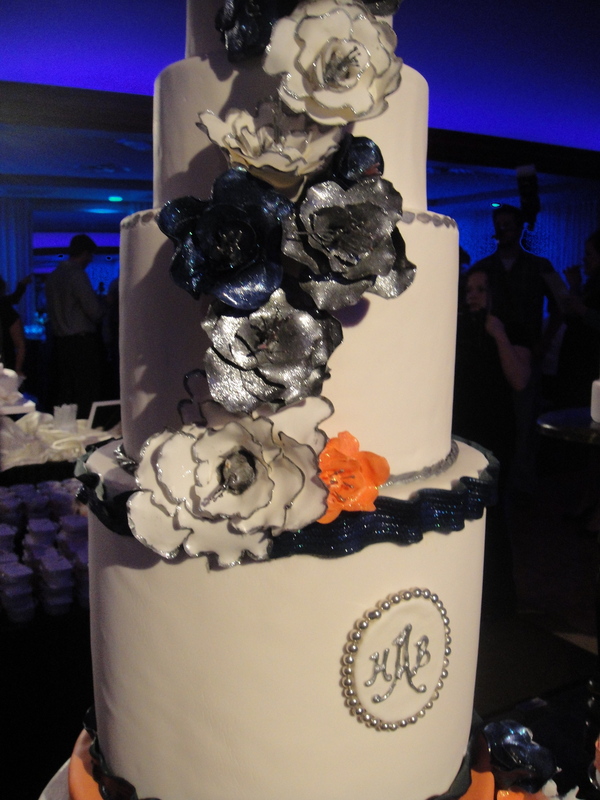 The grey & write cake was my favorite!! I love that it really looks quilted! Ive always seen them flat but I love that it looked ”bunched”!! yeah, the one with the gathering? love! oh, dear, and were they!!!!! Oh those are beautiful cakes, I’m kinda jelouse you got to look and taste all these wonders. #7 sounds like my dream cake 🙂 Amaretto with lemon mousse! Yummy to say the least. oh, you don’t even know…that lemon mousse…was…amazing…and the texture of that amaretto cake was my favorite cake texture. it. was. so. GOOD. Must try to bake it. I have armaretto and lemons…To the kitchen!!! go go go! and i have to know how it comes out! oh, dear! This looks like a dream come true! Hope I get to go to a contest like this sometime =)… I think cake 2 was the prettiest, but would definitely love to try number 5! i think when i walked in, i looked like a kid in a candy store. i had to pick my jaw up off the ground. can you imagine a bridal show? 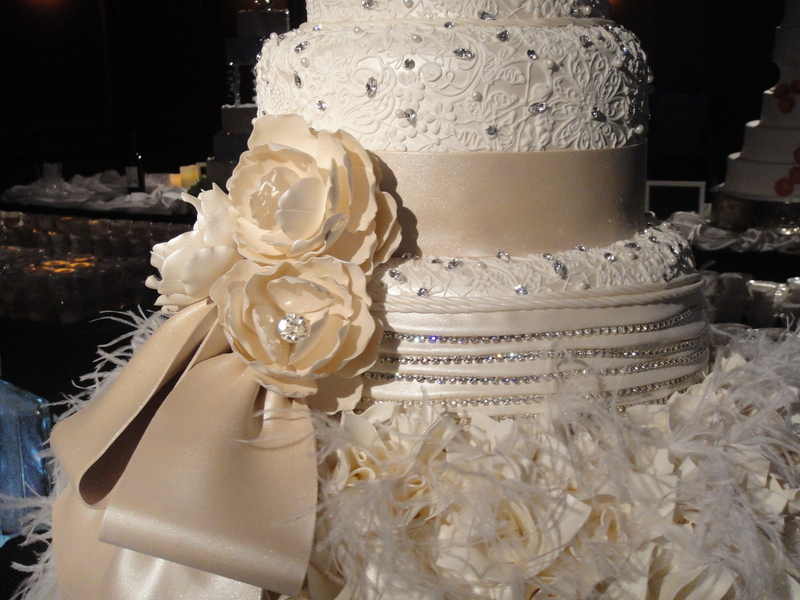 look up bridal shows in your area-some are free and you can taste cakes there!!! They all look amazing, but the one with white chocolate mousse and raspberry filling looks divine! you know what the funny thing is-i never really liked raspberry until that night. the raspberry fillings were SO GOOD!!! i hope i attend more! if you’re willing to make your own cake, you’d be saving HUNDREDS of dollars!!! and it really isn’t that hard! it’s the decor that these bakers did that really was time consuming and required about 6 people, but if you want something more simple, it surely can be done!!! that’s awesome! weren’t they!? i wanted to FAINT! YOU NEED TO SEND ME PICTURES OF WHAT YOU’VE BEEN BAKING!!!!!!!!!!!! i misssssssss yoooooou! Love the minimalist look of the blog. And this was a fabulous post. Cheers!!! aw, thank you! i appreciate it! i’m not really “blog savvy” so i don’t know how to make my blog all dressed up like everyone else’s…haha! That grey and white one really was beautiful, tho I wish it weren’t, well, grey 🙂 On that last one, I think you’re right, remove the columns and make the white clean elegance instead and it could have been beautiful. What a fascinating job to get to go to these events tho!! right!? and eat cake and go to bridal shows? it’s fun!!!! and tasty! a fun and tasty job. i can deal with that. haha! Thanks for visiting my blog! I enjoyed reading your cake reports. 🙂 #4 and #7 are my favorites from the look of them.